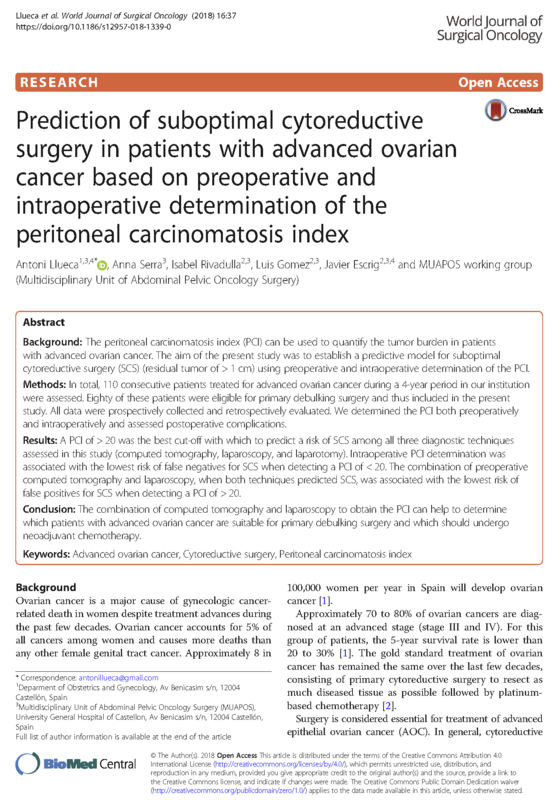 The peritoneal carcinomatosis index (PCI) can be used to quantify the tumor burden in patients with advanced ovarian cancer. The aim of the present study was to establish a predictive model for suboptimal cytoreductive surgery (SCS) (residual tumor of > 1 cm) using preoperative and intraoperative determination of the PCI. In total, 110 consecutive patients treated for advanced ovarian cancer during a 4-year period in our institution were assessed. Eighty of these patients were eligible for primary debulking surgery and thus included in the present study. All data were prospectively collected and retrospectively evaluated. We determined the PCI both preoperatively and intraoperatively and assessed postoperative complications.